In recent years, Flipped classroom model (FCM), has become increasingly popular in higher education. With the model students can study on the content of the course through interactive technologies at home, and practice on the tasks with student-centered activities in the F2F learning environment. The motivation for this relational study was to address the relationship between self-regulated learning skills and academic achievements that higher education students held in Flipped EFL course. The results indicate that the self-regulated learning skills goal setting, environment structuring, task strategies and self-evaluation of the students were developed in high level; time management and help seeking skills are found to be moderate in the flipped implementation. There was a strong correlation between the academic achievement and task strategies, self-evaluation sub-skills of self-regulated learning skills. Additionally, there was a moderate relationship between academic achievement and goal setting, environment structuring skills and a modest relationship between the academic achievement of the students and the time management and help seeking level were noted. The results provide implications for course designers and instructors who desire to provide a better flipped experience for higher education students. Son yıllarda yükseköğretimde yaygınlaşmaya başlayan Ters yüz sınıf modeli (TYS), öğrencilerin evde etkileşimli teknolojiler aracılığıyla ders içeriğini öğrendikleri, yüz yüze öğrenme ortamında ise öğrenci merkezli etkinlikler ile öğrenilen bilgilerin uygulanmasını yapabilecekleri bir modeldir. Bu araştırmanın amacı TYS modeliyle tasarlanan öğrenme ortamında öğrencilerin öz-düzenleyici öğrenme berilerinin düzeyini belirleyerek akademik başarıları ile öz-düzenleyici öğrenme arasındaki ilişkiyi incelemektir. 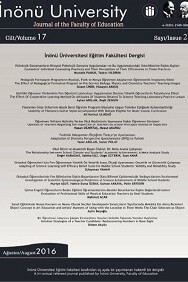 Araştırma bir devlet üniversitesinin MYO Muhasebe bölümünde öğrenim gören 24 öğrenciyle haftada 4 saat olarak işlenen Yabancı Dil dersinde yürütülmüştür. Araştırmanın sonunda TYS modeliyle tasarlanan öğrenme ortamında öğrencilerin amaç belirleme, ortam düzenleme, görev stratejileri ve öz-değerlendirmesinin yüksek düzeyde; zaman yönetimi ve yardım arama düzeyinin orta düzeyde geliştiği belirlenmiştir. Öğrencilerin akademik başarıları ile görev stratejileri, öz-değerlendirme ve öz-düzenleyici öğrenme toplam puanları arasında güçlü ilişki görülmüştür. Diğer taraftan öğrencilerin, akademik başarıları ile amaç belirleme ve ortam düzenleme arasında orta düzeyde ilişki ortaya çıkmıştır. Öğrencilerin akademik başarıları ile zaman yönetimi ve yardım arama becerileri arasında zayıf ilişki belirlenmiştir. Çalışmanın yabancıl dil derslerinde TYS modeli uygulamaları için tasarım ve uygulayıcılara öz-düzenleyici öğrenmeyi belirleme ve geliştirme yönüyle örnek olabileceği düşünülmektedir. Al‐Zahrani, A. M. (2015). From passive to active: The impact of the flipped classroom through social learning platforms on higher education students' creativet hinking. British Journal of EducationalTechnology, 46(6), 1133-1148. Barnard, L., Lan, W. Y., To, Y. M., Paton, V. O., &Lai, S. L. (2009). Measuring self-regulation in online and blended learning environments. The Internet and HigherEducation, 12(1), 1-6. Baepler, P.,Walker, J. D., & Driessen, M. (2014). It's not about seat time: Blending, flipping, and efficiency in active learning classrooms. Computers & Education, 78, 227-236. Boekaerts, M.,& Corno, L. (2005). Self‐regulation in the classroom: A perspective on assessment and intervention. Applied Psychology, 54(2), 199-231. Butzler, K. B. (2016). The Synergistic Effects of Self-Regulation Tools and the Flipped Classroom. Computers in the Schools, 33(1), 11-23. Carson, A. D. (2011). Predicting student success from the LASSI for learning online (LLO). Journal of Educational Computing Research, 45(4), 399-414. Cho, M. H., & Shen, D. (2013). Self-regulation in online learning. Distance Education, 34(3), 290-301. Davies, R. S., Dean, D. L., & Ball, N. (2013). Flipping the classroom and instructional technology integration in a college-level information systems spreadsheet course. EducationalTechnology Researchand Development, 61(4), 563-580. Egbert, J.,Herman, D., & Lee, H. (2015). Flipped Instruction in English Language Teacher Education: A Design-BasedStudy in a Complex, Open-Ended Learning Environment. TESL-EJ, 19(2), n2. Engin, M. (2014). Extending the flipped classroom model: Developing second language writing skills through student-created digital videos. Journal of the Scholarship of Teaching and Learning, 14(5), 12-26. Forsey, M., Low, M., & Glance, D. (2013). Flipping the sociology classroom: Towards a practice of online pedagogy. Journal of Sociology, 49(4), 471-485. Fraenkel, J. R.,Wallen, N. E., & Hyun, H. H. (2012). How to design and evaluate research in education (8 th. Edition). New York: McGraw-Hill. Hu, H., & Gramling, J. (2009). Learning strategies for success in a web-based course: A descriptive exploration. Quarterly Review of Distance Education, 10(2), 123. Huang, Y. N., & Hong, Z. R. (2016). The effects of a flipped English classroom intervention on students’ information and communication technology and English reading comprehension. Educational Technology Research and Development, 64(2), 175-193. Kong, S. C. (2014). Developing information literacy and critical thinking skills through domain knowledge learning in digital classrooms: An experience of practicing flipped classroom strategy. Computers & Education, 78, 160-173. Korkmaz, O., & Kaya, S. (2012). Adapting Online Self-Regulated Learning Scale into Turkish. Turkish Online Journal of Distance Education, 13(1), 52-67. Klingsieck, K. B., Fries, S., Horz, C., & Hofer, M. (2012). Procrastination in a distance university setting. Distance Education, 33(3), 295-310. Love, B., Hodge, A., Grandgenett, N., & Swift, A. W. (2014). Student learning and perceptions in a flipped linear algebra course. International Journal of Mathematical Education in Science and Technology, 45(3), 317-324. Lynch, R., & Dembo, M. (2004). The relationship between self-regulation and online learning in a blended learning context. The International Review of Research in Open and Distributed Learning, 5(2). Mason, G., Shuman, T., & Cook, K. (2013). Comparing the effectiveness of an inverted classroom to a traditional classroom in an upper-division engineering course. IEEE Transactions on Education, 56(4), 430–435. McLaughlin, J. E., Roth, M. T., Glatt, D. M., Gharkholonarehe, N., Davidson, C. A., Griffin, L. M., ... & Mumper, R. J. (2014). The flipped classroom: a course redesign to foster learning and engagement in a health professions school. Academic Medicine, 89(2), 236-243. Moos, D. C., & Bonde, C. (2015). Flipping the Classroom: Embedding Self-Regulated Learning Prompts in Videos. Technology, Knowledge and Learning, 1-18. O'Flaherty, J., & Phillips, C. (2015). The use of flipped classrooms in higher education: A scoping review. The Internet and Higher Education, 25, 85-95. Pintrich, P. R., Smith, D. A., García, T., & Mc Keachie, W. J. (1993). Reliability and predictive validity of the Motivated Strategies for Learning Questionnaire (MSLQ). Educational and psychological measurement, 53(3), 801-813. Prince, M. (2004). Does active learning work? A review of theresearch. Journal of engineering education, 93(3), 223-231. Puzziferro, M. (2008). Online technologies self-efficacy and self-regulated learning as predictors of final grade and satisfaction in college-level online courses. The Amer. Jrnl. of Distance Education, 22(2), 72-89. Sun, J. C. Y., Wu, Y. T., & Lee, W. I. (2016). The effect of the flipped classroom approach to Open CourseWare instruction on students’ self‐regulation. British Journal of Educational Technology. Terry, K. P.,& Doolittle, P. (2006). Fostering Self-Regulation in Distributed Learning. College Quarterly, 9(1), n1. Tolmie, A., Muijs, D., & McAteer, E. (2011). Quantitative methods in educational and social research using SPSS. McGraw-HillEducation (UK). Wanner, T., & Palmer, E. (2015). Personalising learning: Exploring student and teacher perceptions about flexible learning and assessment in a flipped university course. Computers & Education, 88, 354- 369. Weinstein, C. E., Schulte, A. C., & Hoy, A. W. (1987). LASSI: Learning and study strategies inventory. H & H Publishing Company. Woltering, V., Herrler, A., Spitzer, K., & Spreckelsen, C. (2009). Blended learning positively affects students’ satisfaction and the role of the tutor in the problem-based learning process: results of a mixed-method evaluation. Advances in Health Sciences Education, 14(5), 725. Yahyazadeh, F., & Mohammadipour, M. (2016). The role of interest, self-efficacy and academic self-regulation in predicting academic achievement of students of Islamic Azad University. Journal of Fundamental and Applied Sciences, 8(4), 2059-2075. Zimmerman, B. J., & Martinez-Pons, M. (1988). Constructvalidation of a strategy model of student self-regulatedlearning. Journal of educational psychology, 80(3), 284. Zimmerman, B.,& Schunk, D. H. (Eds.). (2011). Handbook of self-regulation of learning and performance. Taylor & Francis.